First Care Ambulance can provide a wide range of medical cover at events from sporting engagements to charity fund-raisers. Through our experience within the events sector, we are able to offer you complete medical provision, from initial planning through to debriefing and reporting. Our senior clinical staff are all registered HCPC Paramedics to ensure the best possible clinical standards and care. We pride ourselves on providing high quality, patient focussed services and we have provided services to many large and small scale events across the UK. Dependent on your requirements we can provide doctors, HCPC registered paramedics, Ambulance Technicians or qualified first aiders thus ensuring your event is afforded the best medical cover available and complies with current regulations – Whether it is a local football match or a festival and everything in between. Our marked response vehicles are fully equipped to an advanced life support level (if manned by a paramedic) and are perfect for ensuring a clinician arrives at the scene in a timely manner. 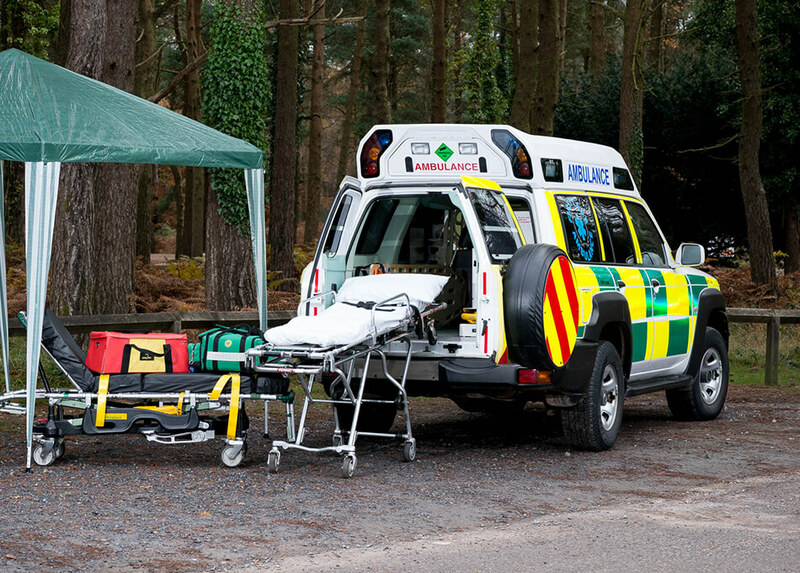 We also operate 4×4 response cars. Our fully marked ambulances are fully equipped to deal with patient’s needs. Ambulance crews usually consist of a paramedic or technician and a first aider. We will also take care of liaising with the local NHS ambulance service as well as nearby hospitals to ensure your event runs smoothly. We have vast experience in providing medical services to a range of events including high-risk areas such as festivals and horse racing events. Please contact us with the details of your event, and one of our event team will provide you with a comprehensive, competitive quote.